It appears Lil Xan was almost a member of 21 Savage’s Slaughter Gang. On Wednesday, a photo surfaced online of a screenshot between the two rappers discussing the potential move a couple years ago. 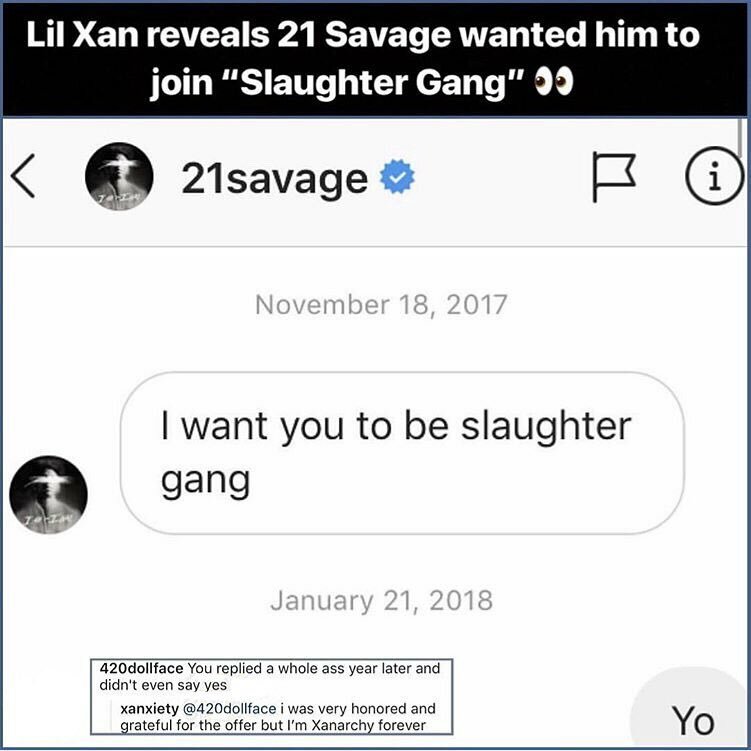 The screenshot shows 21 wanting Xan to be a part of Slaughter Gang. “I want you to be Slaughter Gang,” 21 wrote to Xan all the way back on November 18, 2017. The pic shows Xan didn’t even acknowledge 21’s DM though until a year later, which some fans roasted him for. Now it should be noted that a DM isn’t an official agreement and maybe this is taken out of context of sorts, but it looks to be clear 21 wanted a piece of Lil Xan. Unfortunately for us, we won’t get to hear from 21 as he’s currently dealing with a much larger issue with ICE and possibly being deported back to Britain (where he was born).